In Eastern Jutland the soils are often clayey and rich in nutrients. Rich fens developes where the soil is humid due to high lying ground water. Fens are often found in the many river valleys that transects the eastern jutland landscapes. In earlier times the fens were often used for grazing and hay production. The vegetation was held lowgrowing and the flora was very rich in species. Today it is more easy for the farmer to keep his animals inside and feed them there. Whithout grazing the fens will quickly be dominated by high-growing plant sepcies and bushes. The low-growing plant species will disappear due to shading and the flora will by time be more poor in species. 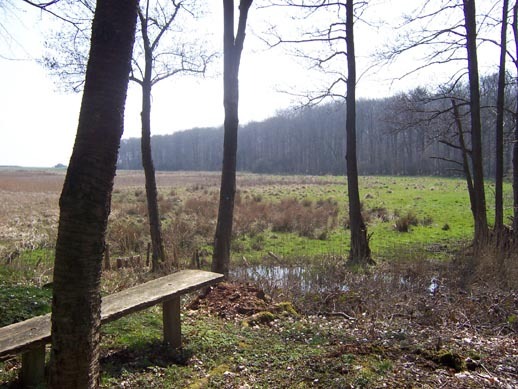 The picture shows a fen in the early spring where the vegetation not really has started to grow. One can see the large hummocks of Juncus effusus and to the left the dry rermains of Phragmites australis.